Xkcd “Time”: The astronomy of the epic comic. A frame from the huge xkcd panel “Time” (frame 403 if you’re curious). 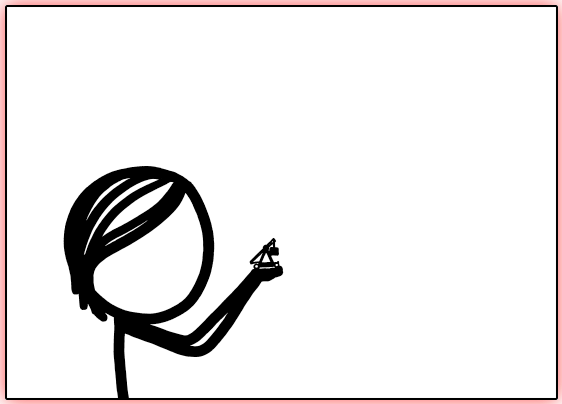 If you read my blog (and I enjoy self-evident statements like that) then you either already know about Randall Munroe’s amazing Web comic xkcd (and the sorta-sequel, What If? ), or you should know about it. Beloved by a zillion geeks across the globe, xkcd uses only crude drawings and stick figures for visuals, but this only serves to emphasize Munroe’s extremely keen mind and sharp viewpoints. In April, he quietly started a new comic: Called “Time,” it automatically refreshed every half-hour with a new drawing. For quite some time it only showed two figures, a man and woman, building a sand castle. But as time went on, hints were dropped that there was more going on, and as the events unfolded, it became clear that Munroe was delivering an epic but understated tale of adventure and exploration. I’ve known about “Time” for a while now, but haven’t written anything, opting to wait for the whole thing to finish. It finally has; the last panel went up July 26. A few days later, Munroe—usually quiet about such things—wrote up a short entry about it on his blog. A few days later, Wired posted a fantastic article about the whole thing, which I urge you to read. My name is mentioned in there, so I figure it’s time for me to come clean as well. Spoilers ho. First, as a break, xkcd fan Matthew Walker put the entire thing together as a YouTube video, which takes a whopping 40 minutes to watch. But I found it entrancing. I’ve known Munroe for a couple of years now, and in June he sent me a note asking for a bit of astronomy help. He was already in the midst of drawing “Time,” and he gave me a synopsis of the story. It takes place 11,000 years in the future, he told me. He wanted to drop hints, subtle ones, into the story that clever people would be able to find. What astronomical events could work for that scenario? My first thought was precession: The Earth’s rotational axis wobbles like a top’s. Right now the northern axis points very close in the sky to Polaris, but that hasn’t always been so, nor will it always be. In 11,000 years it will point in a very different part of the sky, and that will be obvious to anyone watching the constellations rise and set. However, “unlikely” isn’t the same as “impossible,” so I suggested the red supergiant star Antares in Scorpius. It’s on its way to going supernova, it’s bright and would leave a noticeable gap in the constellation, and it’s visible from the comic’s location. Frame 2393 from “Time”, showing the constellations of Sagittarius and Scorpius setting in the far future. For those who are familiar with the constellations, Sagittarius is above the tree, pointing almost straight down; a bright planet (Venus?) can be seen just over the spout of the famous “teapot” shape. 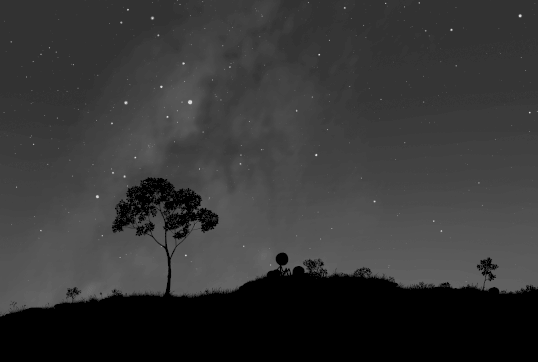 Below it and to the left of the tree is the tail of Scorpius, and Antares would be near the circular head of the stick-figure character sitting on the ground … but it’s not there. A hint that this takes place in the far future. Devoted fans—of which there are many—put together a wiki (a series of explainer pages) for the comic and were extraordinarily clever in figuring out not just that this was the future, but even getting the date it takes place. Amazing. I’m pleased, honored, and proud to have been a small part of this astonishing experiment by Munroe. xkcd is, simply put, one of the best comics on the Web: funny, thoughtful, and even profound. But that is a reflection of Munroe himself and so, I suppose, not a surprise at all.